This evening I was completely shocked to find a Roland TR-626 Drum Composer in mint condition at a used music store in Nagano City today for only 10 bucks!! ( Similar to one in the photo ). Amazing! The Roland TR-626 had the original box, manual, plastic wrap, warranty slip, and everything including an adapter and memory card! I later learned that the reason it was so cheap was the sync mode was set up for midi or external. Thus when you tried to play the patterns it wouldn’t start. You could play the pads, but not the sequencer. I remember this happened before when I bought a couple of Yamaha RY20 drum machines from the very same shop which had the same midi sync setup. If these drum machines are in midi sync mode they do indeed look like they are broken to the untrained sales clerk. Needless to say I grabbed this machine real QUICK!! 1. The TR-626 has a trigger out jack on the back that allows you to use the rimshot as a trigger pulse for arpeggiators/sequencers on old analog synths. This should work perfectly for triggering my Roland SH-101 and Juno-6 synths. 2. The TR-626 has midi in/out jacks on the back so that in addition to trigger out, I can sync external midi gear. Fantastic!! 3. You can hook up the TR-626 to an external sampler and trigger it with a cool 16 step TR grid sequencer. 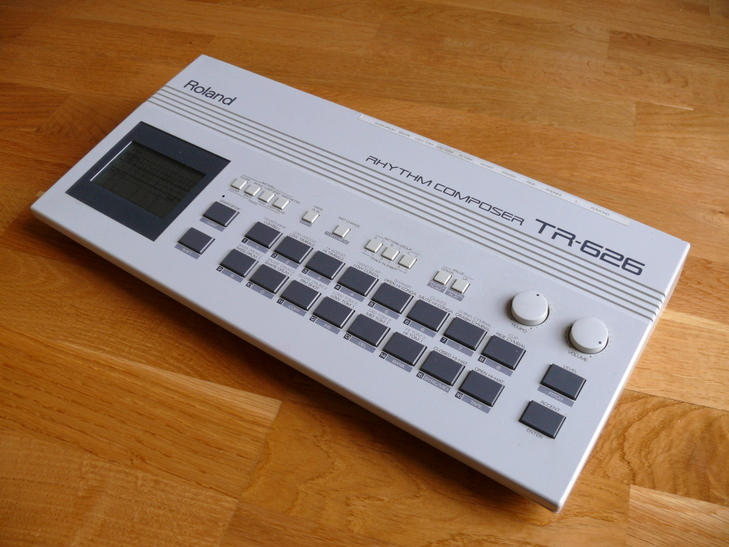 The TR-626 has 30 drum sounds so you can control 30 samples, and you can assign the midi note number/channel for each sample. You can also set accent levels for each individual sound. 4. The TR-626 sports 12-bit samples which I kind of like. They actually sound pretty good and work great for all sorts of electro beat type music. This particular TR-626 sounds pretty clean, punchy, and quite warm. I am quite surprised. 5. The sequencer also is good and easy to use. It has accent (+/- 3), shuffle, and flam. There is a memory card slot and sysex/midi implementation is great. 6. The TR-626 can be run on batteries or with an adapter which is fantastic. You can bring it along with you in the car as it’s quite portable. It has a headphone jack too of course. 7. The Roland TR-626 also has multiple output jacks so you can route individual sounds through separate mixer channels or effect processors. Plus there’s probably quite a bit more to learn about this little gem. All in all, the Roland TR-626 is quite a versatile drum machine. I did not expect to find one this evening in such great shape for such a steal. It’s things like this that keep driving me back to these used music shops here in Nagano each day. Amazing stuff to be found!! Here is a video I found on Youtube of the Juno-6 arpeggio triggerd by the TR-626. Also here is a Roland TR-626 demo found on Youtube. you’re lucky, a 626 must be really sweet!!! down here we have a roland 505 that has been our joy and pride for many years of daily use, always defeating newer machines with it’s simplicity and consistent sound. nothing beats 12 bit samples! I love both my 505 and 626, I have created many songs with each of them. Right now I’m in 707 and 727 heaven. Triggering with the Roland TR-626 works fantastic. It works perfectly with both the arpeggiator and sequencer on the Roland SH-101. I also can midi other drum machines like for example a Korg ESX-1 which has TR-808 and TR-909 samples. It’s so much when when you can sync old analog gear to something more modern. Of course if I had three sets of hands I wouldn’t need to sync everything….laugh. It took me a while to understand how to clear the sequencer memory on the SH-101 though. Having multiple outputs on the TR-626 has also been very useful for varying the sound. I can apply different EQ and effects for each voice which greatly can alter the sound of the drums. The style and ease of sequencing the patterns is also very good. The TR-626 is proving to be quite a flexible machine. Hello Jim, thanks for helping me with my DX7 grey matter awhile back. I have a 626 that I bought new and I agree they are an awesome sequencer. I understand there is a demand for these by circuit benders for D.J. applications. it might be worth more than you think. Hi Jim! This is a helpful post! If you don’t mind that I ask you- I’d like to buy a TR 626 as my first drum machine. I’m finding them online, but they never have the memory cards still in them! Do you know if I can still store patterns within an internal memory bank, or does it have to have the memory card? I won’t be doing anything too complicated.